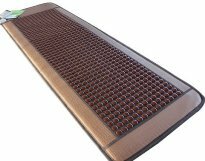 Harness the healing power of tourmaline stones in this extremely popular heating mat. Tourmaline, a 27-part mineral crystal, is a powerful tool for maintaining levels of comfort and tranquility. The darker the tourmaline stones, the stronger the properties of detoxification and protection. This heated bed also exceeds the highest standards for dark schorl tourmaline. You may know that tourmaline, or the poet’s stone, is celebrated worldwide for its beauty and charm. This semiprecious gem is known for channeling purity and is associated with the heart chakra. Tourmaline is often used in water purifiers as well as skin care products. It truly is a stone of wonders. Relaxing on a heated bed of tourmaline stones, you may feel tension releasing from stiff muscles. You’ll float away as your spirit is lifted and your cares melt away. Regular use of meditative relaxation on a heated bed of tourmaline crystals can transform your health and happiness. Lying on this mat teaches compassion, hope, and never-ending love and devotion. Tourmaline is coupled with deeply relaxing infrared heat to go deeper and relax your aching joints and muscles more effectively than you’ve ever imagined. You may reduce your need for addictive and expensive pain relievers and depression medication. You may find your self full of inner peace and outward vitality.